Criminals looking to exploit your brand for their own profit will use any means they can find. Cybercriminals are working 24/7 to devise sophisticated methodologies to hijack your brand and violate your customer’s trust using multiple communication channels. In the age of social engineering, SMS, social media and email platforms provide them with even more tools to organize a multi-pronged attack and effectively gain access to sensitive data. With messaging abuse increasing at alarming rates, security and IT professionals suffer new challenges when actively trying to prevent network security threats while performing damage control for attacks that infect their systems. So how to you keep pretenders out and secure your networks? 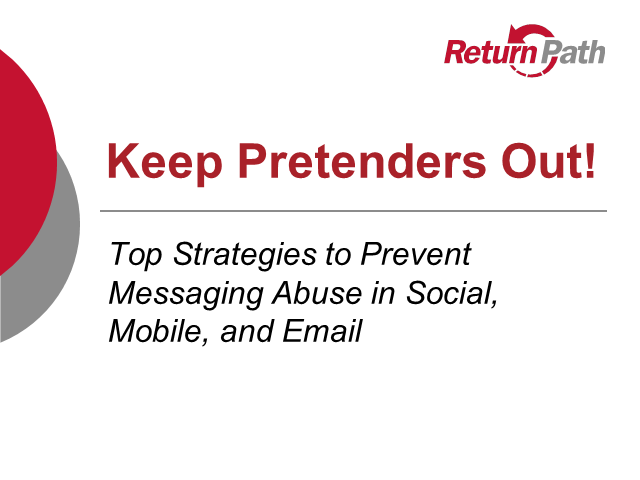 In this session renowned security expert Sam Masiello will help you navigate the complex landscape of messaging abuse and arm you with key strategies to protect your company and customers from malicious messages.